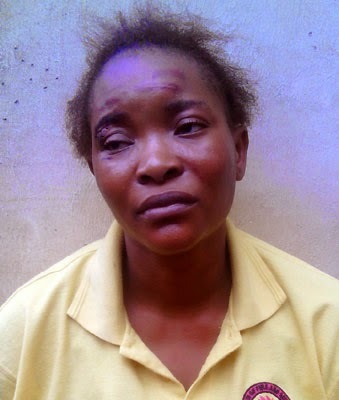 Police have arrested the house maid who kidnapped the Orekoya three children, 24 hours after she was employed last week at Lawanson Road, Itire area of Surulere, Lagos. She blamed her kidnap activities on her husband. Her true name is Funmilayo Adeyemi, a mother of four, and not Mary Akinloye as she claimed and she is 35 years old, against the 23 she claimed. The suspect allegedly masterminded the kidnap of the three children (Demola, 6; Adedamola, 4, and Aderomola, 11 months) with the aid of her husband, Waheed Kareem, her brother in-law, Akeem Kareem and her brother in-law’s wife, Joke Oseni, who are currently on the run. Preliminary investigation also revealed that her syndicate was responsible for the kidnap of two children last December in Magodo area of the state. She reportedly kidnapped the children, Raphael and Michael, four days after she applied for the job of nanny through OLX , an online sales portal. To cover up for their shady deal, her husband, a film producer with the business name Global G Entertainment, reportedly employed his wife, his younger brother, and his sister in-law as markers. She was arrested by operatives of the Special Anti-Robbery Squad, SARs, Wednesday, barely 24 hours after the release of the kidnapped Orekoya children at Coker Estate, Shasha. The weak can never forgive. Forgiveness is the attribute of the strong. See the link below for more info.